The Chesapeake Bay blue crab fishery accounts for 50% of the United States blue crab harvest, and is worth about $80 million annually. It’s estimated that about 600,000 crab traps (also called “pots”) are actively fished on an annual basis in the Bay. 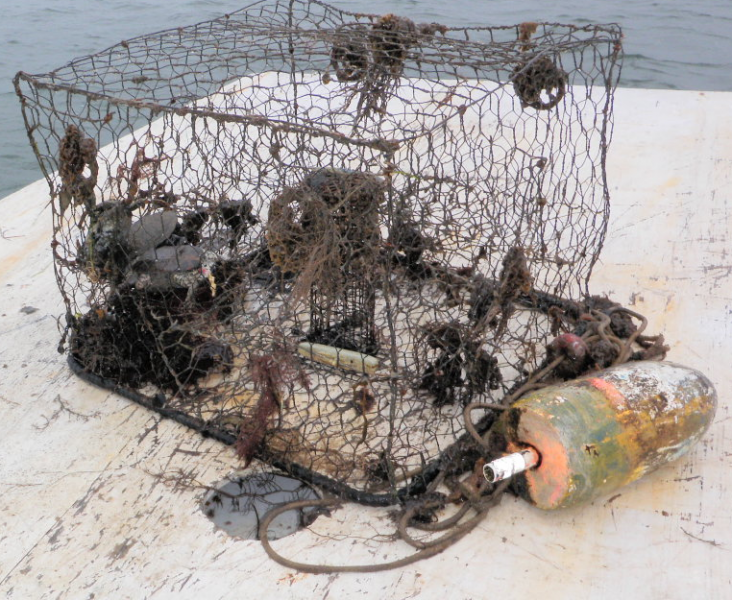 Some crab pots become lost (derelict) when the pot’s buoy line becomes detached or cut, either by vessel propellers, faulty lines, or vandalism. Strong storms can also move pots from their original deployment location, making them difficult to relocate. In addition, pots may be abandoned, as has been observed at high rates in some regions of the Bay. Once lost, derelict pots can damage sensitive habitats and continue to capture blue crabs and other animals, often resulting in their death. To assess the ecological and economic impacts of derelict blue crab pots in the Chesapeake Bay, a diverse team of researchers from CSS-Dynamac, Inc.; Versar, Inc.; the Virginia Institute of Marine Science; and Global Science & Technology, Inc. recently completed a comprehensive Bay-wide assessment, funded by the NOAA Marine Debris Program. 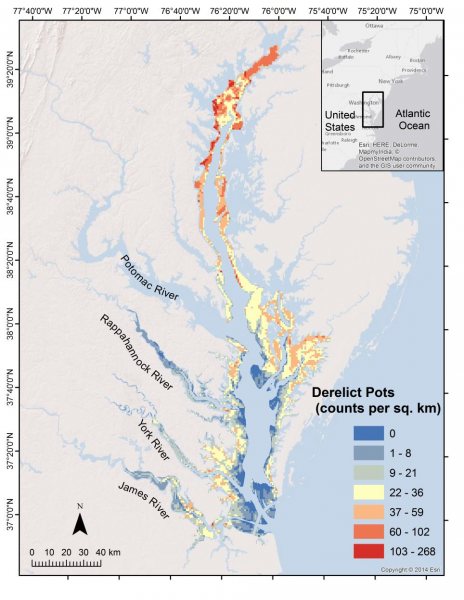 This study estimates that some 145,000 derelict crab pots exist in the Chesapeake Bay, with 12-20% of actively-fished pots becoming lost each year. Not surprisingly, many derelict pots are found in areas of the Bay with heavy recreational and commercial boat traffic or fishing activity. These derelict pots kill over 3.3 million blue crabs annually. In addition, many other economically-important species can be impacted, such as white perch (3.5 million captured annually) and Atlantic croaker (3.6 million captured annually). Derelict pots thus “compete” with pots that are in active use —they catch or attract crabs that could otherwise be caught by active pots, and can therefore reduce commercial harvests. Through statistical modeling, this study found that targeted derelict crab pot removal programs greatly increase the number of crabs caught by actively-fished pots, resulting in significant economic benefits for the fishery. The model estimated that derelict pot removals increased Bay-wide crab harvests by over 38 million pounds over a six-year period (2008 to 2014), amounting to $33.5 million in added revenue (in 2014 dollars). This study also found that pot removals are most effective when they focus on areas with intensive crab fishing activity. This study also suggests management actions that may help in reducing the number of new derelict pots and their associated negative impacts. These include minimizing boat traffic in popular crabbing areas and educating boat operators about avoiding active crab pots, which would help reduce the number of cut buoy lines. Creating and maintaining derelict pot recovery programs, or incentivizing watermen to remove lost pots, would also help reduce the number of derelict pots in the Bay. In addition, outfitting crab pots with biodegradable “escape hatch” panels would reduce mortality of captured animals. In addition to the Chesapeake Bay assessment, the team also created a Guiding Framework for derelict fishing gear assessments, which can be applied to other fisheries and/or regions interested in conducting similar studies. The final report for the Chesapeake Bay Assessment and the Guiding Framework document can be found on our website.